is an award-winning journalist specialising in the Middle East, and author of Not the Enemy – Israel’s Jews from Arab Lands (2009). The Tunisian torture choir, as I dubbed them for convenience, should have been competing for sound-space with the group of rappers and streetdancers wearing V for Vendetta Guy Fawkes masks. But somehow it all blended pretty well amid the sprawling outdoor space at Tunisia’s World Social Forum, an annual gathering of international civil society organisations. This was the forum’s first meeting in an Arab country — appropriately enough, the Arab country that kicked off a chain of revolutions two years ago. The choir, a group of men chained together and dressed in prison uniforms, were singing about Tunisia’s former political prisoners — more than 3,000 at recent count, incarcerated and horribly abused by the former regime; now released, but adrift and unsupported, they are struggling to re-enter society. The rappers, mostly Tunisian students, were meanwhile spitting rhymes about the economy, unity, employment, and periodically rousing the crowd to chants of: ‘Work! Freedom! Dignity!’ These were the demands of the Tunisian revolution that toppled the Western-backed dictator Zine El Abidine Ben Ali in January 2011. The choking regime might be gone, but those three demands are still unmet. When I got closer to the all-male political choir — tuneful chanters, really — I could see two members acting out torture scenes, with one using a stick to fake-beat and fake-contort the other’s body into a stress position. Nearby, a group of Palestinians were chanting and debke dancing — Levantine folk-dancing — aware that Palestine was on everyone’s mind at this meeting of global justice movements. Meanwhile, within a group of forum delegates next to us, an argument had broken out over Syria, one of many heated discussions about that conflict during the forum’s three days — some of them, by all accounts, frightening and aggressive — at once a symptom and an emblem of the visceral divisions over that terrible war. As forum participants descended on Tunis from around the world at the end of March, they were met with relief in a country where the tourism industry has tanked, in part due to the Western media’s fear-mongering over violent political tensions. There is suddenly a buzz in streets that have been too quiet ever since foreign offices started issuing warnings over travel to Tunisia. The cacophony of politically-themed protest culture bursting onto the streets these days is not necessarily directed at the visitors, however. Nor is it particular to this week. It has been growing in the capital and beyond since the revolution, not least because it now can, after all the years of repression. But also because there are things to be said, directly to the people, that no other medium can convey as well. Here in Tunisia, artists of all types are asserting public ownership of spaces once controlled by the state, reclaiming the streets, reasserting the significance of protest as a political ideal. That sentiment is fizzing up everywhere in the capital: among Tunisians performing a local spin on the Harlem Shake; in the streetdance clusters on side streets; among the teens who burst into rowdy political song on public transport, banging train doors as percussion, and indulged by other passengers even if the din makes their babies cry. It’s a conscious, proud, humorous repossession of spaces that were once out of bounds, used exclusively by the regime to push its own self-aggrandising doctrines. The idea here is to ‘democratise culture’ — to spread its reach from the elites into other social layers, with performances for which permits are deliberately not sought, partly as a political statement and partly as an indication of intent. ‘We don’t need the system to recognise us,’ Ben Yahmed told me. ‘We need the people to recognise us.’ There is something else going on here, too, a subtext but just as strong. To take part is to protest; the act of participation is itself an act of empowerment, an embracing of new-found democratic rights. Several of Art Solution’s YouTube clips begin with the words of Stéphane Hessel, the German-born writer, diplomat, concentration camp-survivor and French Resistance fighter, who died in February this year: ‘Créer, c’est résister. Résister, c’est créer’ (To create is to resist. To resist is to create). It’s hard to imagine Hessel unhappy with where his message landed: with progressive artists using the medium of dance to awaken a desire for cultural and social rights in the midst of Tunisia’s postrevolutionary process. It’s a process in which battle lines are constantly being drawn up and then torn up, as the right to offend collides with the right to be offended. Ben Ali’s legendary repression was especially hard on Islamists, who were stuffed into underground prison cells, while, at street level, religious dress such as the headscarf was banned. Now Ennahda, an Islamist party, is leading a three-way government coalition, following Tunisia’s democratic elections in October 2011, the first since the country’s independence in 1956. There has also been a visible rise in public religiosity. Ennahda says it won’t impose Islamic values on society, but neither, apparently, will it stop hard-line religious groups that try to do so by forceful means. In June last year, ultrareligious Salafist demonstrators disrupted ‘Le Printemps des Arts’, an art exhibition held in La Marsa, a wealthy beach town just outside Tunis. The demonstrators sabotaged works they deemed offensive to Islam, scrawling on them ‘death to blasphemous artists’, before clashing violently with police on the streets. The work they judged most awful was one by Mohamed Ben Slama that spelt out ‘Allah’ in plastic ants crawling out of a child’s schoolbag. Equally offensive was ‘Let him who has not’, an installation by Nadia Jellasi of veiled mannequins emerging from a pile of stones. Clearly, the works were intended to be talking points, but the Salafi protesters wanted only to shut down the conversation. Now the two artists are facing prison sentences of up to five years for charges of ‘harming public order and morals’. Tunisia’s Islamist-majority government, once horribly repressed, appears to see no irony in letting religious extremists repress their enemies in turn. The government itself wants curtailments on freedom of speech written into the constitution, and it doesn’t want scathing political commentary hitting the nation’s airwaves, or emblazoning city walls. Meanwhile, laws curtailing public protest and expression that were a feature of the Ben Ali regime have yet to be revoked. Why is the government so frightened about all this popular, cultural expression? True, it’s spontaneous, unpredictable and chaotic — traits that authoritarians find innately worrisome. But there is something deeper going on in Tunisia, a country in the midst of defining the fundamental building blocks of its identity. As the debate continues to rage (and enrage), the trouble for the standard political parties in postrevolutionary Tunisia, including the religious ones, is that party politics is perceived as tired and empty. In stark contrast, cultural protests are imbued with the open, dynamic energy of a new generation embracing brand-new liberties. In the battle for hearts and minds, there’s little contest over which approach is more appealing. ‘We have a better way of talking. It touches more people, it causes more reflection,’ the photographer Rim Temimi told me. Temimi, whose pictures of the Tunisian revolution have been relayed around the world, sees the flourishing of protest art as part of an awakening, or reconnection, for Tunisians: ‘Inside, people know what art is, but after 23 years of censorship, they forgot.’ While politicians and local media are caught in a tussle between what is religious and what religion’s role in society ought to be, art has a habit of bringing the focus back onto things that actually matter to the public. It is striking that this word ‘awake’ keeps coming up with artists, set against Ennahda, an Islamist party whose name means ‘renaissance’, or rebirth. The artist and Nawaat blogger Selima Karoui, for example, told me: ‘The government doesn’t want artists to awaken people’s consciousness to another point of view, to writing about the poor, or the social reality of unemployment.’ Both movements wish to craft a new Tunisia, but the artists keep reiterating that the Islamist politicians are out of touch and have misjudged the mood of the nation. Certainly, the politicians did not expect all this cheeky irreverence, the artists’ humour and the situationist-style protests that would erupt in response to its decrees. Last year, the government was wrong-footed after it tired of endless protests in the capital outside the loathed Ministry of the Interior, and erected barricades of coiled barbed wire along the length of Habib Bourguiba Avenue. The street touched a raw nerve with Tunisians. As the focal point of the revolution, it became, not surprisingly, the natural rallying ground for ensuing protests. There was an immediate civic response to the barbed-wire barricades, quickly orchestrated over social media. On 18 April last year hordes of people turned up with books to read along the avenue, and nearby booksellers decided to distribute free volumes to passers-by. The silent mass action loudly stated: these streets are ours. A few months ago, the same avenue hosted another piece of theatre-as-protest, when citizens of the country whose uprising was labelled the ‘jasmine revolution’ staged the ‘parsley protests’. This was sparked off after an independent TV station that had been critical of Ennahda found itself in dire financial difficulties. Station representatives said that advertisers had been phoned and warned off advertising with the station. When the channel, Elhiwar Ettounsi (‘the dialogue’), called for donations on Facebook, they were flamed by Ennahda supporters claiming the drive was as futile as trying to sell parsley on the streets. 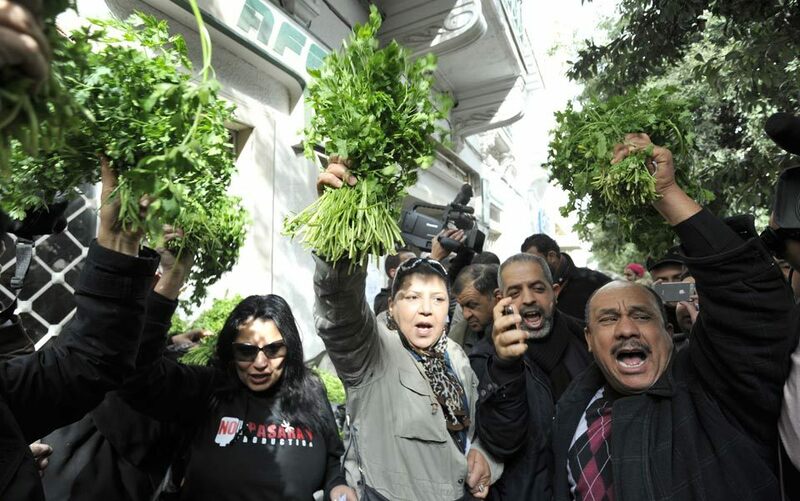 Rising to the challenge, on 28 February the station took to the streets for a self-styled day of herb-selling. It raised around £47,000, and created the edifyingly absurdist scene of men and women strolling the streets of Tunis with clumps of parsley looped over their ears, like leafy forelocks. What Tunisians want, according to one graffiti artist, is for the country to steer away from its current, uncharacteristic and divisive arguments over religion. ‘We used to live all together, and the problem after the revolution is how we can stick together,’ said the ‘calligrafitist’ eL Seed from Gabes, who last year decorated one side of a minaret at his home city’s mosque with a verse from the Qur’an about tolerance. He said the work was about bringing people together and democratising art. Here again is the truth-teller function of art — the thing that keeps it real, and forces the focus onto real problems, not the knee-jerk ones invented to perpetuate fractious infighting. It is what makes this new culture so worrisome to those in power. But it is also what keeps the culture-motor running, this task of bringing clarity. From those rappers at the World Social Forum to the streetdancers at the capital’s medina, it is about keeping expectations raised, free speech in flow, and those cornerstones of the revolution — ‘Work! Freedom! Dignity!’ — alive in people’s hearts. It is not just the taste of freedom that has awakened so much protest culture in Tunisia, it is the response to a clear call of duty. It is the graffiti artist’s job to annotate city walls with word of the forgotten poor, the rapper’s task to rhyme about police repression, and the dancer’s purpose to remind Tunisians that they own the streets. People have been silent for too long. Now it’s time to just keep talking.